DisZine » Blog Archive » Walt Disney World Swan and Dolphin Offers No Tricks – Just Treats! Walt Disney World Swan and Dolphin Offers No Tricks – Just Treats! Looking for a fall getaway with a twist? Check out this spooktacular offer from the Walt Disney World Swan and Dolphin! Tomorrow – Halloween – book your reservation with the Walt Disney World Swan and Dolphin Resort and receive a special treat, which will be drawn randomly, and will be immediately applied towards your reservation. Just call 888 828 8850 between the hours of 8am and 7pm EST on October 31, 2011, and speak to a reservations agent to take advantage of this awesome offer! Say “TRICK OR TREAT” and the special gift is yours! 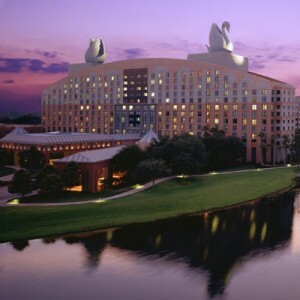 Located in the the heart of the Walt Disney World® Resort, the deluxe Walt Disney World Swan and Dolphin is within walking distance to Epcot® and Disney’s Hollywood StudiosTM. Guests of the Walt Disney World Swan and Dolphin receive special Disney benefits including the Extra Magic Hours in the theme parks, complimentary Disney transportation throughout Walt Disney World®, on-site character dining, Disney ticket desks and advance tee times on Disney championship golf courses. So set your clocks for bright and early on Halloween and hurry – Rooms will go quickly! Offer is valid for stays November 1 – December 23, 2011. One-night/non-refundable deposit required at time of booking. Additional terms and conditions apply.